This morning we’re celebrating the 20,000 Homes Campaign and launching the next phase of our work together to end homelessness in Canada. 20,000 people is a lot of people. I’ve been trying to think of a way to show how many people 20,000 people really is. Turns out 20,000 people is roughly the number of people we can pack into the Saddledome in Calgary! 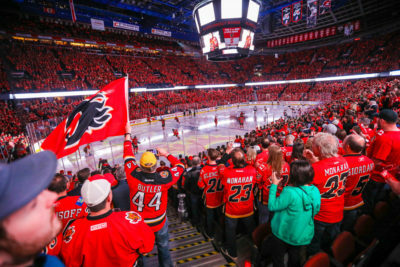 The added benefit of this photo is we get to show folks from Edmonton and Toronto what a play-off hockey game looks like. Now imagine all of those people … without a home … at risk of death from homelessness … languishing in homelessness for years or even decades … suffering from illness, addiction, mental illness, trauma, stress and fear. It happens to at least 235,000 Canadians per year, 35,000 every night and costs $7 BILLION per year. It kills an unknown number of people – there are over a thousand names on Toronto’s homeless memorial alone – it reduces life expectancy for thousands. The scale of homelessness is the same our worst natural disasters. We have to respond accordingly. The 20,000 Homes Campaign was launched in June 2015 because homelessness is disaster that has lost its sense of urgency. We wanted to prove homelessness was a solvable problem and provoke an urgent response to this disaster in our communities and across the country. We launched our campaign with 20 communities and watched it grow to 38 communities in 8 provinces and one territory. In the last three and a half years the work of ending homelessness on the ground in your communities has begun to transform – you’ve acted with urgency; you’ve gotten out into the streets and shelters and under bridges and into alleyways to know every homeless person by name, document their needs and work urgently to house them. You’re building more focused, efficient and effective homeless systems focused on ending and not managing this disaster. And along the way we’ve seen the introduction of a National Housing Strategy and a new 10-year, federal homelessness strategy, Reaching Home that was created in your image. The impact of your leadership with be felt in over 60 communities from coast to coast to coast, beginning next month. You’re proving homelessness is a solvable problem. 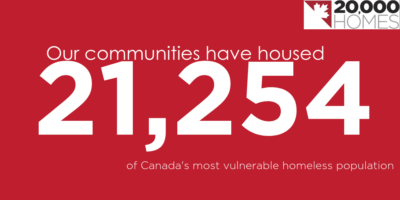 You’ve lit a fire under your community’s efforts to end homelessness and set in motion nation-wide changes that are transforming Canada’s response to homelessness. One of the most important outcomes of the 20,000 Homes Campaign is that we’ve learned a lot more about what it will take to end homelessness. Urgency – to break the inertia of the status quo and build momentum. Strong local leadership – Look in any community anywhere in the world where homelessness is going down or has been eliminated and you’ll find strong leaders like each of you in this room. Real time person specific data – knowing every person by name, documenting their needs and acting urgently to solve each person’s homelessness. Homelessness will end one person at a time. Rapid implementation of proven and evidence-based approaches like Housing First. By working together and learning from one another we can do the stuff that works faster. Building more efficient and effective housing systems – that responds directly to the needs of the people in them with the right housing as fast as humanly possible. Relentless, constant data driven improvement and an unwavering focus on ending homelessness. And we’re already making important progress on all counts as we launch Built for Zero Canada. Kawartha-Halliburton has reduced chronic homelessness by 51% in just 6 months and Medicine Hat is inches away from functional zero. 11 communities have quality by name lists and others are making measurable progress on coordinated access systems. We’ll soon be chalking up communities making verifiable reductions in chronic homelessness before the end of the year we’ll have our first, and perhaps second and third community achieve functional zero. Friends – this is the beginning of the end of homelessness in Canada. It is such an honour to be here with you today. In this room are the leaders who will be the first, second, third … 20th and 30th communities to end chronic homelessness in Canada. We’re here for the next two days in this learning session to learn, improve, set goals, and most importantly launch into action. I hope you’ll take a minute to reflect on the success you’ve achieved with the campaign. Know that big hairy audacious goals are achievable – and push yourself in the next action cycle. Homelessness is a disaster – you know it. I know it. We also know it is solvable. Let’s act with the urgency this crisis deserves. I’ll wrap with a final word to the people we serve, our homeless neighbours – you are doing the hard work of ending homelessness yourselves. I wish we had homes for all of you today, but we don’t. What we do have is the resolve to get there as fast as we can. And we won’t stop trying until we do.